The Sleepy Orange butterfly (Abaeis nicippe) is a common southern butterfly whose larval foodplant are sennas (one of the reasons I'm planning to add Desert Senna to my garden). 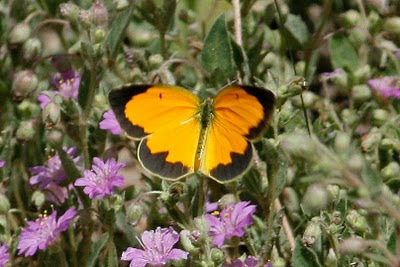 They typically sit with their wings closed,providing a view of a pale yellow coloration. I was lucky at San Pedro and caught a nice view of its wings open. Unfortunately, it was a good 20 feet or more away, but the photo is usable none-the-less.